Initial searches for Wahl on the net only turn up German sites, and this thread. I wonder where Bate found the 3089 E. Grand Blvd address? Looking at some old maps, and how the numbering system changed, this would either be near Jos. 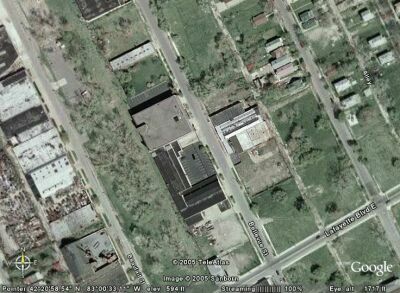 Campau, or after the Blvd takes its turn south before turning towards the Packard factory, which might place it between McDougall & Mt. Elliot. Re: Gray - 614 Charlotte didn't exist pre-1920 as far as I can tell. Charlotte ended at 6th with an address number ~300. After renumbering, 614 would be between 2nd and 3rd. I'm shrugging my shoulders on that one. I think the fancy plant built in 1910 would be the one on Oakland in H.P. Interesting that Gray became part of the U.S. Motor Company in 1910, which also took control of Brush and Maxwell. 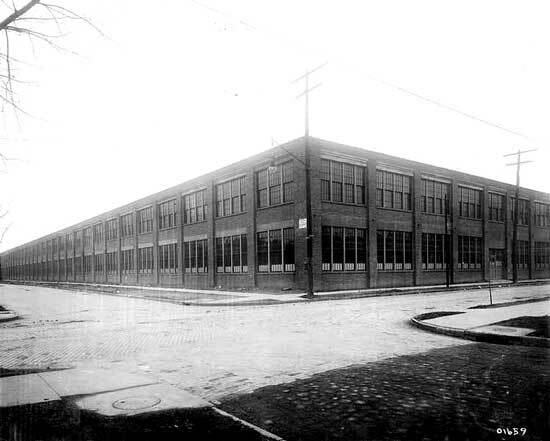 Hornwrecker posted a 1911 picture of the Brush/Maxwell factory in H.P. on page 11, and maybe there's a connection there. Could it be the same factory? 2102 Mack under the old numbering system is at the DTRR. 22 Lafayette seems incomplete, as the Canton intersection is at 6900. 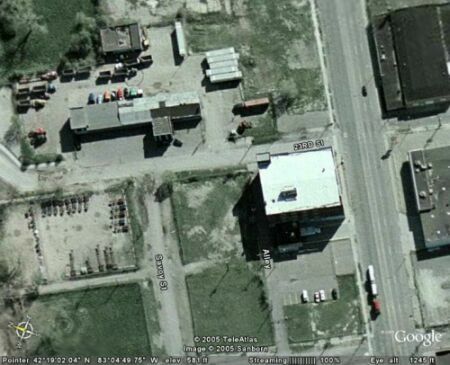 (1082 pre-1921) This is the location of the Gray Marine Motor Company. "The Wahl Motor Company was formed in the late spring of 1913 by a group of capitalists, including George Wahl, Alvan M. Dodge, and Joseph Hofweber. 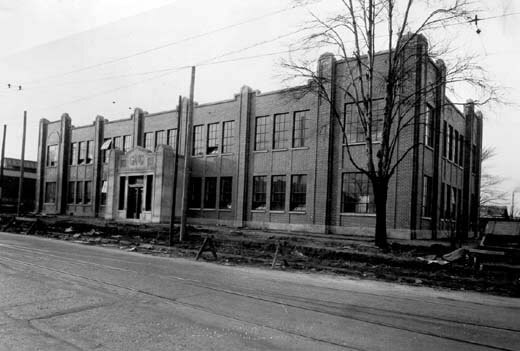 The Hofweber Motor Car Company, in LaCrosse, Wisconsin, was trying to produce a car during the same time period, and considered producing it in the Wahl factory at 3089 E. Grand Boulevard, but never got beyond the development stage. The Wahl Company had been under capitalized with $85,000 which resulted in early cash flow problems. In an attempt to spur sales, the Wahl Company advertised that automobile dealers could sell the car with their own trademark on the radiator. By the fall of 1913 creditors were complaining, and on October 6, George Wahl drank a bottle of carbolic acid, ending his life at 35 years of age. The Wahl Company was in receivership by December 1913, and taken over by St. Louis automobile men for $100,000. James Root became president, Joseph Nulsen VP, and A.G. Nulsen, Jr., secretary and treasurer. The price of the car increased from $750 for the roadster and $790 for the touring car, to $850 and $890. The M.W. Bond Automobile Company of St. Louis became the chief distributor of the Wahl car. I didn't realize that the address numbering system on the Grand Boulevard started at the ends (river) and increased toward Woodward. 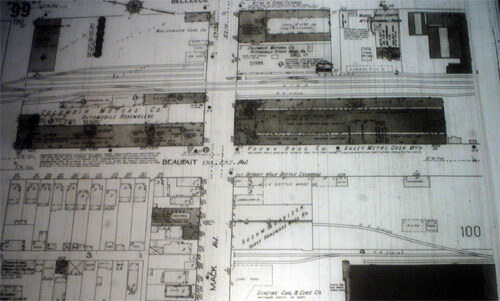 Additionally, there was no change to the numbering system in 1921, so 3089 E. Grand Boulevard in 1914 would be the same place it is today, which is at Woodward. What's there now? "Why not go into the automobile business? With your own car, bearing your own name, and with your own trade mark on the radiator? That's where the real money is in this business, and that's the real way to build up a business that no one can take away from you at a moment's notice. Of course the Right Car is the important factor. Well, here it is, and we are prepared to enter into contract with you to deliver this wonderful car at a price that will amaze you. People are better posted on the real points of superior motor car design and construction than they were several years ago. you have to show them a real car. And at a really attractive price. You can see for yourself how modern and complete this car is by a glance over the specifications in the adjoining column. The ad itself doesn't indicate that that is where the factory is, maybe just the front offices, but Szudarek writes as if he has more information than the ad itself. I think Bate has this book as well, so that's probably where he got it. Oops, forgot the zero on the Lafayette address, edited it in, the ad had 220, which still seems incorrect. Probably another misprint, these Gray Motors ads have some of the most variable address numbers that I've seen, must have been cheap ad space in haphazardly printed magazines. 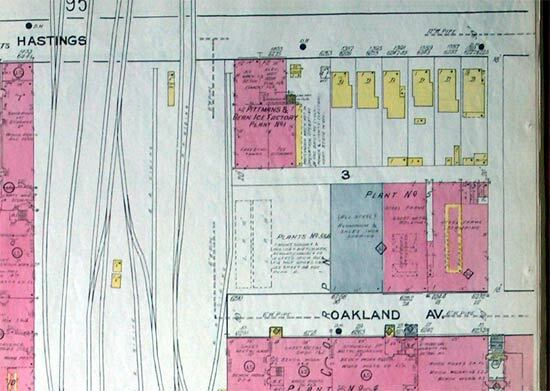 Now that you mention it, that drawing looks a lot like the Maxwell plant on Oakland near Rhode Island. Will go back and check. Man, I have to go back and figure out the Blvd #-ing system, I too have it all wrong in my mind. The Milwaukee Jct pamphlet has a Ford Motor Co. bldg at the corner of Woodward and EGB with the address of 3088 EGB/7310 Woodward. It now houses some State of Michigan offices. 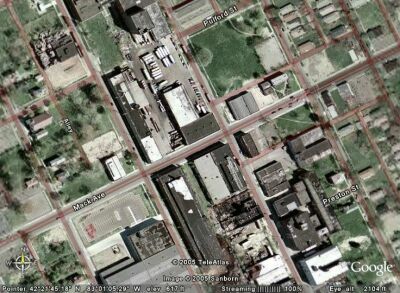 (#36 on the map) So this Wahl bldg would have been accross the street from the Ford bldg. Maybe their office was at the corner of Woodward and Charlotte, and a picture of their plant just happens to be above it on the letterhead. I can't picture anything that industrial or that long, in that location. Earlier you mentioned Clayton & Lambert. The only address I have for them is 6283 Beaubien, which puts them in the heart of the Milwaukee Jct in 1925. That would be across Beaubien from the Ford Piquette plant. Does the Milwaukee Jct brouchure show C & L there? They must have moved to the Conner plant the following year. I see no mention, so far, of Clayton and Lambert in the Jct pamphlet. 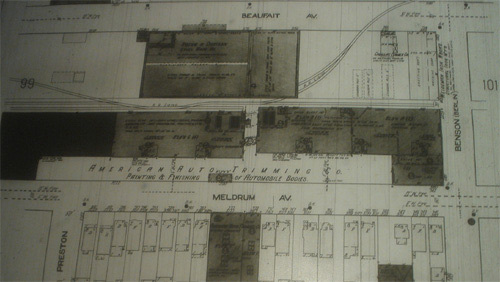 From the coachbuilt site, here it the early history of the firm, but no mention of the address of their Detroit plant. In Ypsilanti, Michigan, in the year 1882, three young and aggressive brothers named Lambert started a pioneering venture - the manufacturing and sale of gasoline burning blow torches. Mechanics found the intense portable heat of these torches useful and time saving in the soldering of pipes, etc. As word spread about these new handy devices and the demand for them grew, the business flourished. In 1887, a patented firepot for melting lead was added to the torch line. Its inventor, a Mr. Clayton, was taken into the partnership. Growth continued and in the year 1891, Clayton and Lambert Mfg. Co. filed Articles of Association with the state of Michigan. By 1899, demand for the Company's products had increased beyond its productive capacity. A larger manufacturing facility was needed. 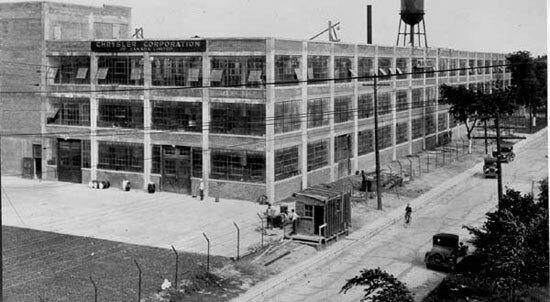 Detroit was becoming the center of manufacturing for that section of the country and offered many advantages. A site with railroad facilities was purchased and a suitable plant was built. 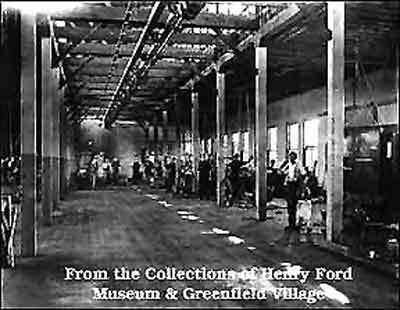 At this time, this location was in the center of a growing automotive industry, with neighbors like Ford, GM and Cadillac. The torch and firepot business continued to grow and prosper with distribution throughout United States and Canada. 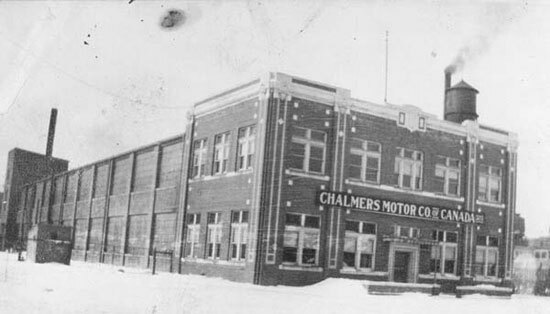 In 1915 the Company established a metal stamping division for the manufacture of automotive parts. During the World War I, the Company produced powder time fuses, truck cabs and large quantities of torches and firepots for all US services. The Detroit Historical Museum Milwaukee Junction brochure doesn't mention Clayton and Lambert at all, and certainly not across the street from the Ford Motor Company Piquette Avenue Plant. 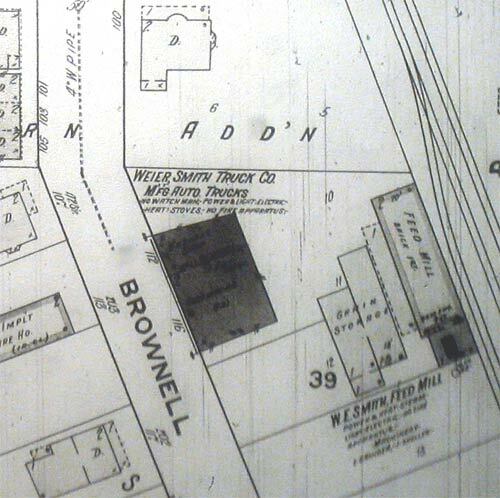 What is identified in that location is designer William B. Stout's studio. However, the basic research for the Milwaukee Junction brochure was done by two young interns from the National Park Service, who may have missed Clayton & Lambert, especially if they weren't there very long. I found in writing the brochure, that the two interns had done a good job with a few minor exceptions. 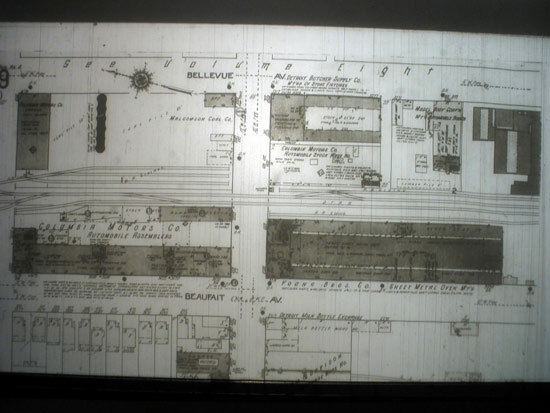 For example, they had the National Can Company on East Grand at the tracks (the building on Wetherbee Place that's just been converted into apartments) producing aluminum beer cars in 1919. National Can and American Can on Trombly did not produce cans here, they produced automobile parts. National Can made the "Mayo" brand radiator and other parts from sheet metal stampings. Thinking aluminum was being used for beer cans in 1919 is an error of youth. While some car bodies, perhaps the electrics, were made from relatively expensive aluminum in the 1910's on, beer came only in bottles until the c.1935, when steel cans were introduced. Aluminum beer cans came in c.1960. But, you've got to be at least 50 years old to know that, so the interns can be forgiven. As for the Wahl Address, the City property seach doesn't turn that up as a valid address. I'm guessing it was demolished if there was a factory there... If it was a sales office, then where was the factory? Here is the second draft of the coachbuilders list, which is getting as big as THE LIST. Should I have two lists, one of car makers and coachbuilders, separately, or one master, overly long list? American Body& Wagon Works-1623 Michigan Ave.
Briscoe Mfg. Co. -(1910s-1920s)- ??? Central Auto & Wagon Wks- 567 High St.
Clayton & Lambert Mfg. Co.-(1915-1970)- 6282 Beaubien, Devine St. & Conner> Hudson 1929 (Kahn 1925), moved to ??? Detroit National Body Co - 44 Victor, H.P. Everitt, B.F.- (1899-1927) 63-65 Fort St.
Field Body Corp- 180 Victor, H.P. Fisher Body Plant #4- Oakland Ave.
Fisher Body #19 - Piquette and Hastings. Holland Trailer & Body co-2037 1st St.
Murray Mfg (1913-24)- Fordyce St and Morrow St., 1600 Clay St.
Standard Wagon Works-(188?-1908)-??? , Fisher #1? John McArthur of Detroit Michigan built the aluminum bodies for the DAC or Detroit Air-Cooled Car of 1922-23. Described as a veteran auto body builder. <---- E-mail if you're interested. jjaba votes for separate lists. Coachbuilders aren't car nameplates. They don't deserve to be up there with the car makers. The list would get massive when others start adding design shops, parts houses, tire folks, etc. In Detroit's automobile hey day, it seemed like everybody was making something in their garage and basement. You worked all day in a big plant, then at night kept the neighbors up all night with ca-ching, ca-ching, ca-ching. In jjaba's case, a print shop in his coal bin. It would be nice if eventually a map could be made if this ever nears completion. Is it time to mention all of the truck, and truck body builders that we've barely scratched the surface on, yet? How's this for an outline for THE LIST? This might work best for the file, and would be easier to color code locations if it was ever mapped out. I like it, it may be big, but... It will save on Lowells bandwith! 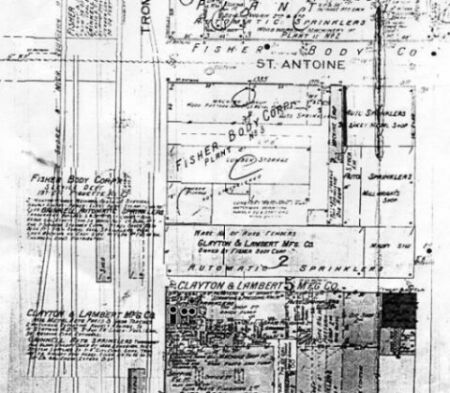 I dug through my Sandborn Maps and found Clayton & Lambert on a 1922 map. 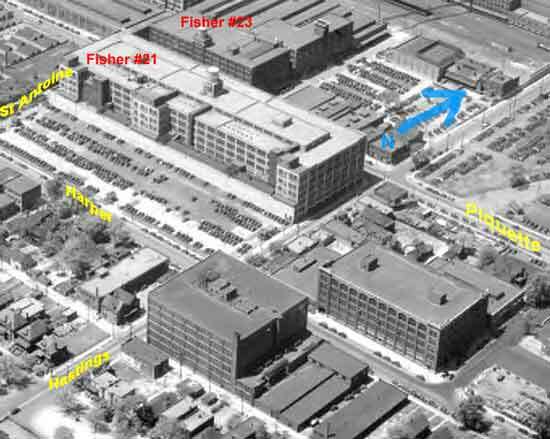 I was going after the Fisher plants so I didn't get a complete scan of the Clayton factory. The photocopys don't come over very well once the size has been reduced so sorry if you can't read anything. 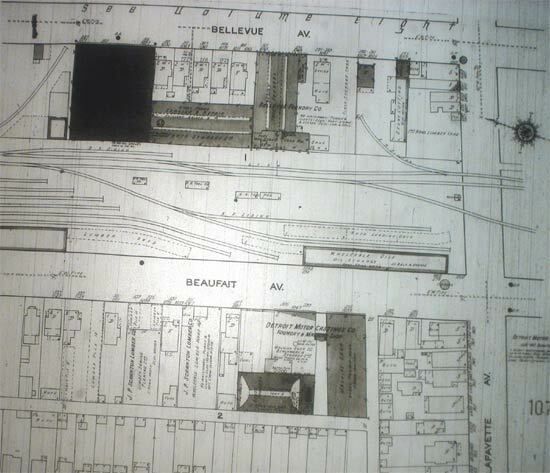 The plant shown was south fo Trombley, west of St. Antoine with Fisher Body plant #3 to the east. Now that the weather is getting cold, I will eventually head back down to the library to look for new old maps. Unfortunately, I've been through all of the good books leaving the research to the microfilms which are all messed up. Sven Do you have an address for Fisher #3? another plant not on the list. ( I wish those were higher def, if I squint my eyes and stand back from the monitor, I can almost make out real words. ) Anyone ever see a mention of Fisher plant #1, which I'm guessing was the Standard Wagon Works that they bought from their uncle Albert to start Fisher Body? I sent a copy of the yesterday's draft of the OCF List to Aiw, but will put it into a better format soon. I broke it into four sections, automakers, coachbuilders, trucks, and part suppliers, which makes it easier to work with. It would be nice to pass it around so you could make ammendments, eventually. Would a .rtf or .txt be the most accessible file form, or something else? I've found a few more names when I read an article about the Liberty Truck made for WWI. Hornwrecer, I thought that Fisher Body #1 was in Flint. Home of the famous Sit Down Strike? The address is right where the photocopier ended its scan to the right. Sorry. I resized this on a pc using the computer supplied editor. It's a guessing game as to what size to make it for it to fit. I have Photoshop on another computer where I work with the map photographs which is a lot better. It's a promotional book put out by the Windsor area in 1913, touting all the business' that are here... Sorry. How about American Auto Triming? Where did all those Gotfredson's come from? 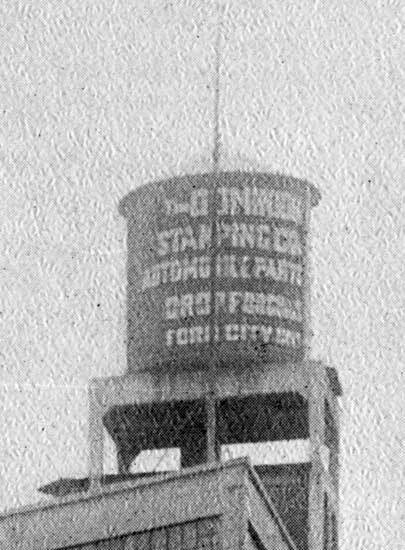 A close up of the water tower advertises "Auto Parts & Drop Forgings"
Since it was mentionned a while back.... Here is the Segrave Factory in 1913. The building still stands, but was expanded, and is now in General Disrepair. I was surfing around on the web, and found some old photos of the Windsor side. These were all on website of the Windsor Public Library. They are property of either the Library, Municipal Archives or Museum. 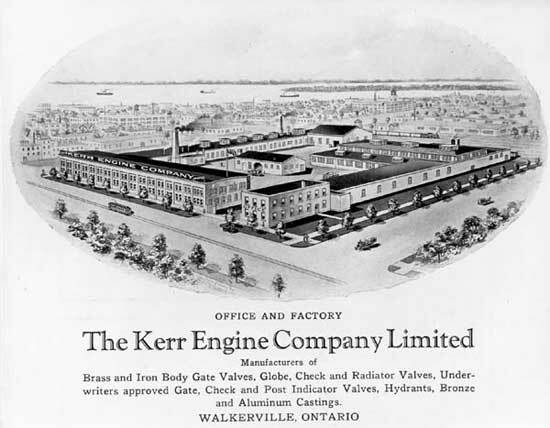 Kerr Engine? Have we covered this one? We have Segrave Fire engines today. Where are they made now? As always, fine scholarship on this thread. Thanks Andrew. Dewitt Clintonville, Wisconsin is a small little town 50 miles West of Green Bay. It is amazing how industry can exist in such places, but they do. General Motors	Walker Rd. Walkerville	Assembly - 1930 Chevy - Pontiac Cars. 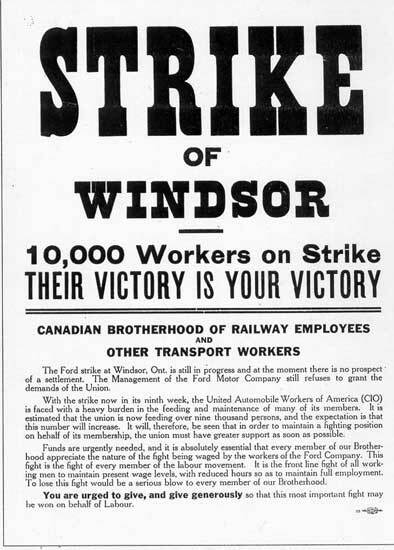 When the Tudhope Motor Car Co. went bankrupt in 1913, there were plans to develop a new plant in Windsor. 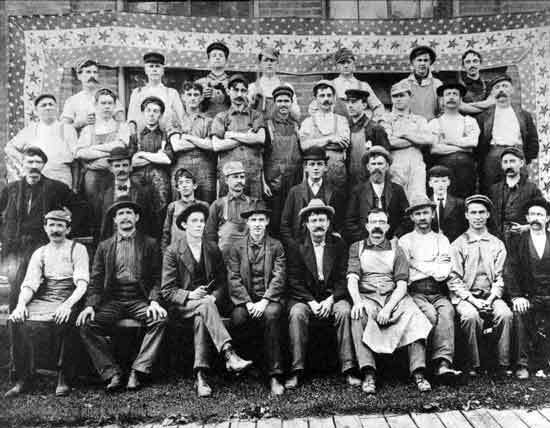 Tudhope was established in Orillia, north of Toronto in 1909. 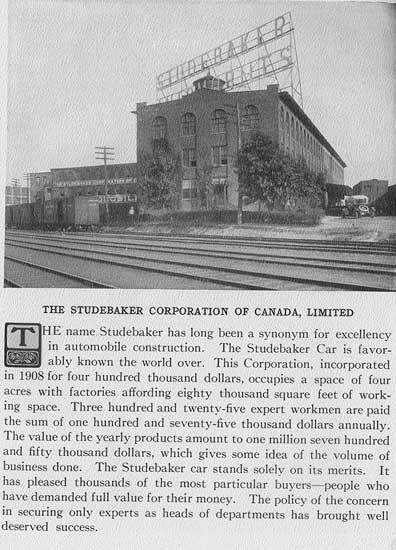 In 1914, Frank E. Fisher, manager if the local Studebaker plant, joined forces with F.W. Vollans of Tudhope. The plan was to sell Tudhope Cars under the Fisher name, using the remaining assets of the Bankrupt Company. Some vechicles were assembled, while others were put together from parts. I'm glad somebody else, particularly a Canadian, is doing the Windsor list. Damn, that is a long list, and I imagine it will get a lot longer. I started inputing the OCF list into an Excel worksheet. I put in a column named "Type" which has a letter: A for automaker, C for coachbuilder, P for parts supplier, and T for anything to do with trucks. Other letters could be added later, and should make for easily classifying into special type lists. I also have a "Notes" column for miscellaneous stuff. I made it up to H in the makers, and am already going stir crazy mit der kutting und pasting. What is immediately obvious, is how many holes there are in the list. I will reformat and add in the Windsor info. into the list you emailed me. Here is the link to the US Army museum page about the Liberty Truck. Of interest to us is the list of firms who contributed to it. 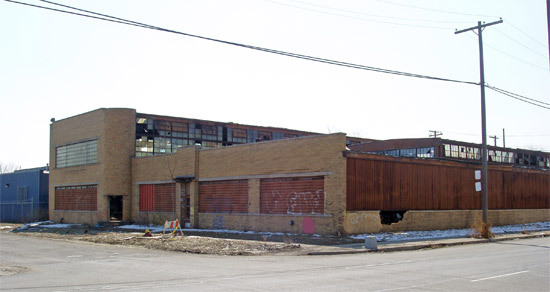 I haven't forgot them K. But I did come across a refernce to "Windsor Carriage Works, owned by ML Menard"
Looking through an article on Gotfredson for trucks made in Detroit, I found that the plant was on Gratiot, in the former Kolb-Gotfredson Horse Market (???). They made trucks there from 1921 to 1946, although towards end they were in limited numbers. I've been making lots of entries on The List, so far, about 280, and have been clearing up the Chrysler/DeSoto/Plymouth/Graha m/Dodge/Maxwell/Chalmers/etc.. .
thing. Probably some Windsor area info in the timelines Aiw. The List is up to 138 auto factories, 82 coachbuilders, 55 trucks, and 44 parts suppliers. Oy. OK, thanks to Hornwrecker and his hard work, I am pleased to host the first public release of the master list. If anyone wants a copy of this as an Excel spreadsheet (57k), email me at my username (at) gmail.com. This would make it a lot easier to update, and if only one person could do it at a time, and email it around, it might work better. I haven't gone back over the whole thread again to fill in the blanks yet. Somehow the thought of looking at over a dozen pages for the tenth time, doesn't appeal to me right now. Time for posting some new photos. AIW and Hornwrecker. What a scholarly pair. Thanks, Merci. 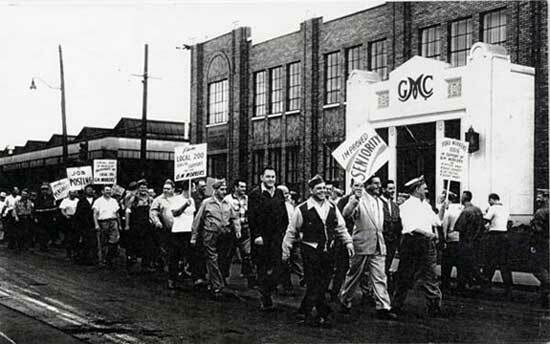 For a change of pace here are some strike action photos at the Motor Products Corp plant on 11801 Mack Ave, probably taken during the 1930s. There's a little bit of the building showing in each photo, but the rest of the scene is well worth posting. 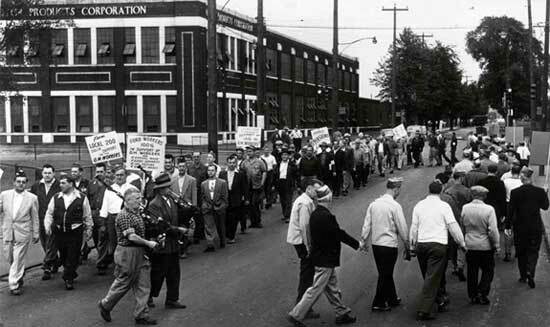 This must have been one of the early UAW strikes, but I'm not really familiar with labor history. 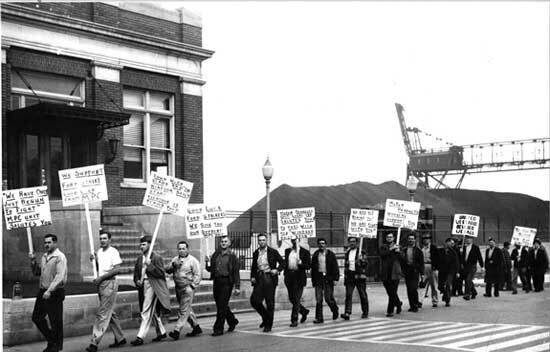 The Windsor Motor Products Factory is in the background of the First one. Including part of the disruption of 1945, that I posted about above. You know, you could search forever looking for Motor Products photos, but do an end-around and search for strikes... et voila! I really like that iron fencing in my photos, and that GMC emblem, probably done in ironwork in your second pic. 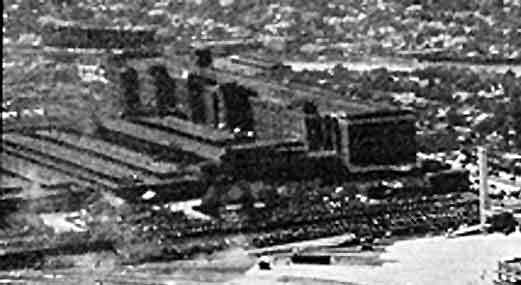 An aerial view of the Cadillac/Fisher/Fleetwood plant on Fort St.; an enlargement from a photo that I posted on the 2nd Train Terminal thread. 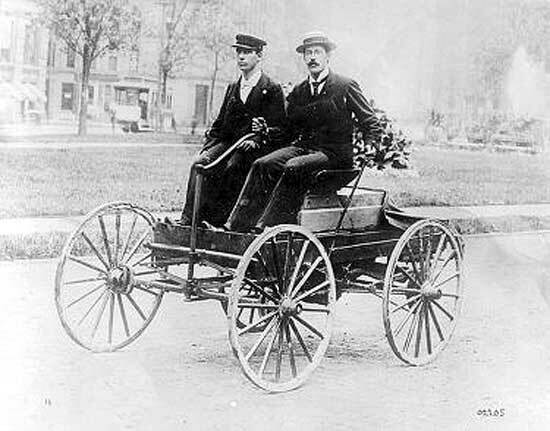 It's been a bit quiet around here today, so I think that I'll post a photo of the first automobile that graced the streets of Detroit. Charles B. King made this in his machine shop at 112 St. Antoine, near Congress, and took it for his famous spin on March 6th, 1896. This pre-dated Henry Ford's jaunt by a few months. I too wish I had the opportunity to talk to my grandfather. He was the youngest son of the mayor of Ottawa and apparently was quite a trouble maker. What did you do with problem kids when they became of age? You put them on the train to Detroit. I can't remember what year it was except that he came to town when Pingree was mayor. In his last years (1950s) as he became senile, he would often ask my mother if she "remembered how nice the Alger's carriage was?" So who's posing with King? 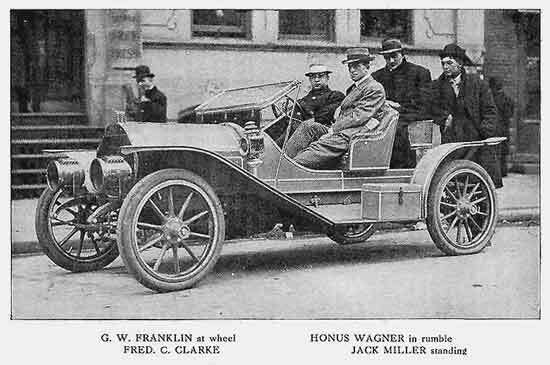 That's Oliver Barthels in the `896 photo with Charles Brady King (1869-1957) in Detroit's first automobile. Barthels was King's assistant and good mechanic in his own right. Both were involved in automobile mechancial design for many years. You can see a 1956 replica of the King car at the Detroit Hisotrical Museum's Motor City exhibit. It was built in 1956 by the J. L. Hudson Company celebrating 60th anniversary of the first automobile driven on Detroit's streets. It was donated by the Webber brothers, Richard, James and Joseph, nephews of J. L. Hudson, who never married. They ran the J. L. Hudson Company for many years. King and Barthels were consulted in the building of the replica, if my memory serves me right. J. L. Hudson also lent his name to the very successful Hudson Motor Car Company, which he funded, but was never actively involved in its management. To see all the vehicles in the Detroit Historical Museum Collection go to www.detroithistorical.org, click on "Collections," then "Transportation History." Thanks for the Charles KIng information, I don't think any of my grandparents had any contact with any early automakers, unless some stopped off for some pastries at my Grandfather's bakery on Jos Campau (Warsawa Bakery). He did own a WWI era Dodge. Going along with early makers, I found a couple of photos from the D.A.C at the Henry Ford Museum site, which is obvious from the small res, and huge watermark. I don't think I've seen an interior shot before of the factory on 1363 Cass Ave.
Bob Cosgrove, excellent collection for us to see. Thanks. But where do you store the 100 cars and other artifacts of Detroit history? Thanks to Hornwrecker for his great photos. Hey Picture Posters, I have a whole mess of new Sandborn Maps to share. What shows detail beter, higher dpi and smaller size or maximum size (500 x whatever) and lower dpi? Any opinions? Thats great news Sevn1977. Looking forward to seeing them. Here is a pic of something that never ocured to me, how was the production shipped aside from truck and rail. And you thought Bumper to Bumper was on the Lodge after the fireworks. Psip, great photo. Where's zit-at, yr. make and models of the cars? jjaba, down by the riverside. 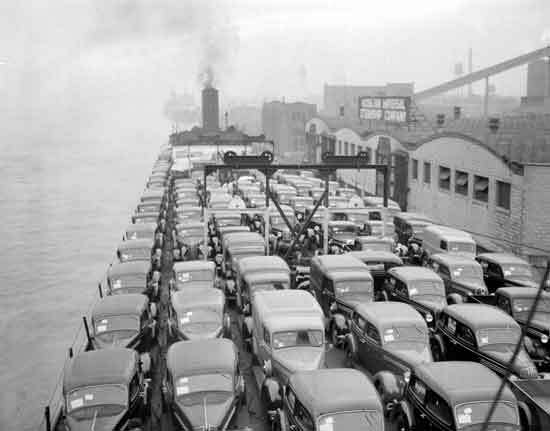 That is at the Nichols Terminal, I would guess they are GM products of 1930s vintage. The caption on the photo said they were bound for Buffalo. Thanks. Hope other motorheads give us more details. Is Nichols on the Eastside? Sorry, jjaba doesn't know the Detroit River very well. Th caption in Psip's post says the ship is the Graham C. Woodruff. Maybe The Rock could give us some details. The sign says Nicholson Universal Shipping Company. Located at 2654 E Atwater. Here's another shot of autos being loaded onto the William F. Fitch, and the caption says it is the first shipment of autos by boat. I thought they would have shipped by ship sooner; maybe the caption means the first shipment that season? 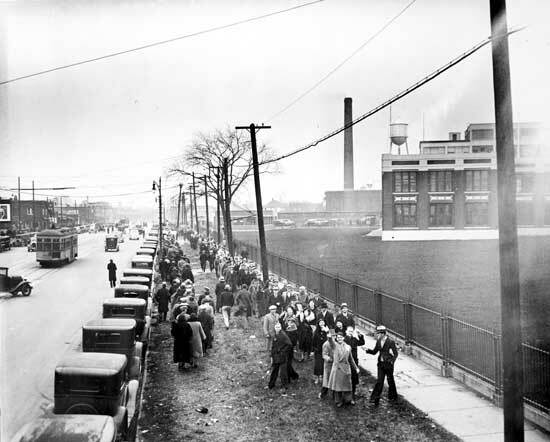 This is a later photo of autos being driven on to the T.J. McCarthy, another auto shipping comapny, and here is a picture of their lot near the river, which I think was on E Jefferson near McDougal. I don't know what make of cars those are, but I know Hudson shipped from a location on the east riverfront. 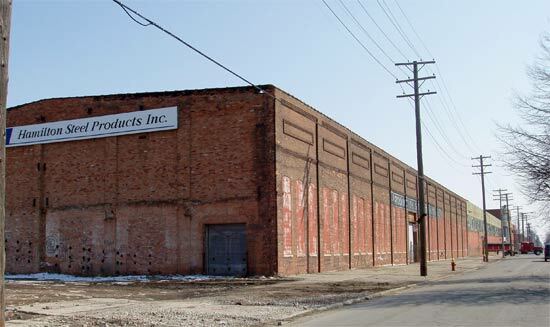 When I was researching Graham-Paige for the spreadsheet, their building on McKinstry near Fort, that remained a mystery, turned out to be a shipping and export center, so it must have been near the river somewhere on the Westside. Maybe it will show up in some old shipping photos. The T. J. McCarthy and Nicholson steamship companies used converted overage lake freighters equipped with what was nicknamed a "flight deck" erected above the main deck thus providing two levels of automobiles, which of course, were driven onto the ships. I had a ring-side seat looking out my Parke-Davis office window as the ships turned around after loading. The loading area was west of the Coast Guard Station at the foot of Mount Elliot where Harbortown is now. 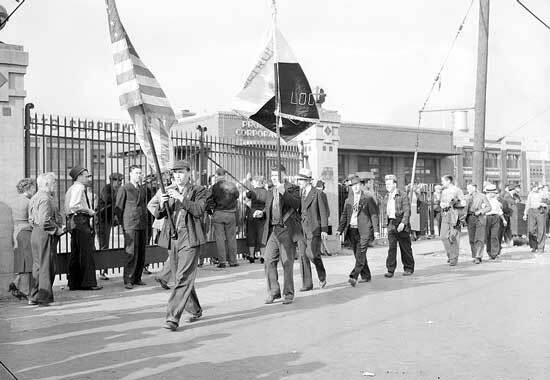 The ships' auto cargos were carried to Cleveland or Buffalo. I don't know if any went west. 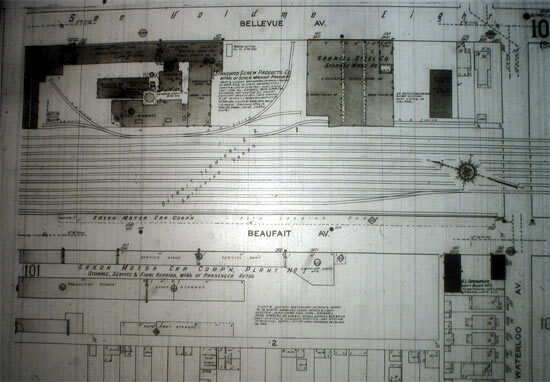 Due to the excentricities of railroad rating making, the steamships were cost effective versus highway trailer or railcars. They last operated c.1965. The cause of their demise was the Interstate Commerce Commission finally allowed the railroads to adjust their freight rates to be competetive. And, the advent of bi-level and tri-level 80 foot automobile cars was also a factor. Here are a few odds and ends from the Sandborn Maps. The b&w shots are all from 1922. They might look bad but have some interesting information. I need to figure out a better way to shoot these. I found two Saxon plants on Beaufait. One that we knew about at Waterloo and another by Gratiot. 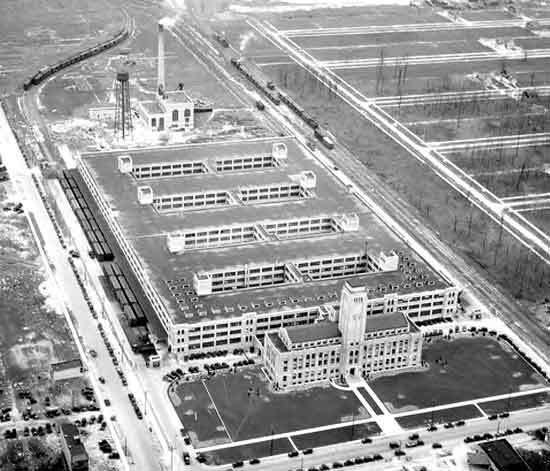 Here's a Columbia factory that used to be Hudson that once was Aerocar that probably was a farm that belonged to Jean St. Jaba before he moved to the Westside. Notice the building across the street. 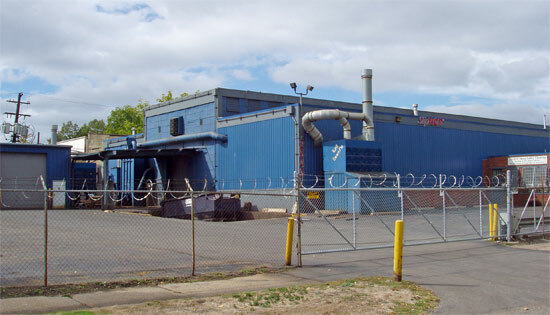 It is Young Bros. Co. - Sheet metal Oven Mfg. Could the building to the north be Hank the First's Mack Avenue plant? 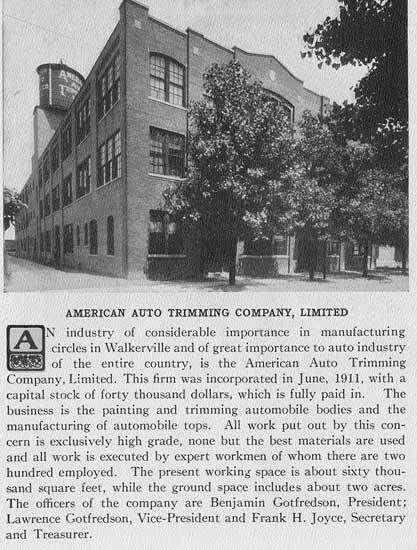 Off of Meldrum is American Auto Trimming Co. - Painting & Trimming of Automobile Bodies. The last for today is the location of a C.R. Wilson plant on Howard by St. Anne's Church. 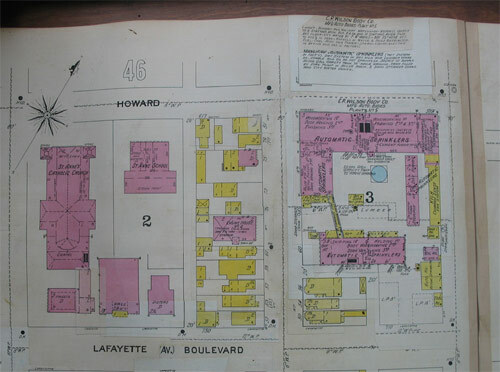 I believe the map dates from 1918 but if you look closely, you can see that the building plan has been glued on top of what used to be there. Oops. Here's American Auto Trimming. The north end, closest to the camera looks like it was built near the beginning of the century. The south end has a newer addition. 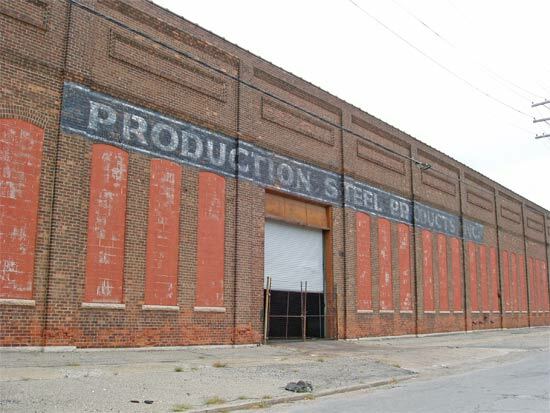 Finally, we have the answer to the brick factory at Mack & Beaufait - the one with the faded paint that the Detroitblog guy was Briggs; Young Bros Sheet Metal. 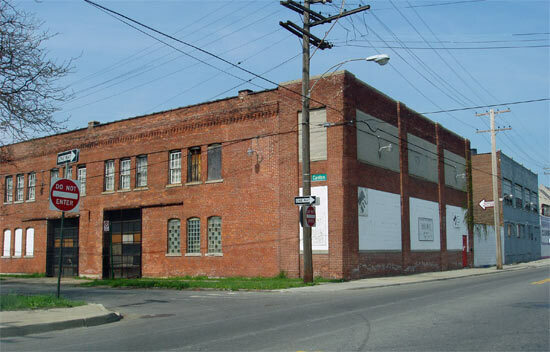 My 1925 directory lists them as sheet metal workers, 6500 Mack Ave, but makes no mention of oven manufacturing. Maybe Briggs used the building briefly after Young Bros moved on. The site of the C.R. Wilson shop next to St Anne's is now an empty field. Interesting find on the "new" Saxon plant, so I guess that brings the count up to three, with the McGraw plant. I need to research the company a bit, because I don't know much about them. 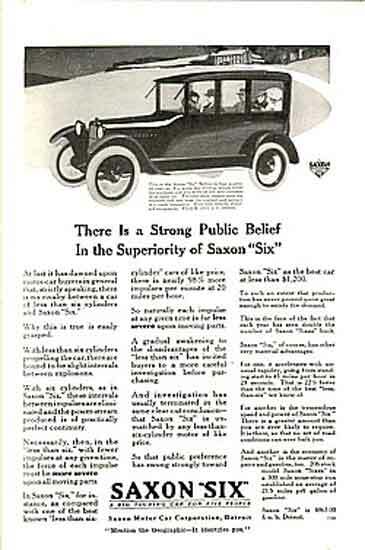 While looking for some Saxon info, I did find out that Benjamin Gotfredson (again that name) was president of Saxon Motor Co from 1918-19. 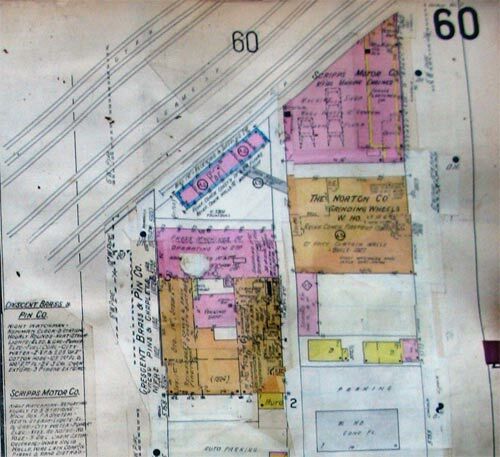 Of more interest on this page was a drawing of the Gotfredson Truck factory on Gratiot. 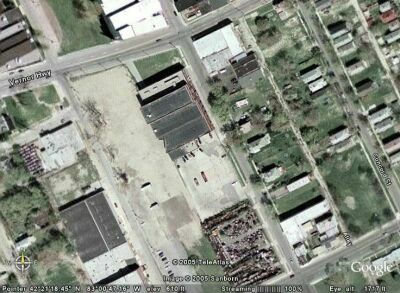 The addresses listed are 3601, 3599 and 3579, which would put it where the Faygo plant, 3579 Gratiot is today. Gotfredson made trucks in the former Kolb-Gotfredson Horse Market from 1921-46. From an old forum thread that mentions the Faygo factory. A few more Sandborn Maps. Hinkley Motor Corporation - Auto Truck Motor Mfg. I believe 1918. It looks like part of the building is still there. 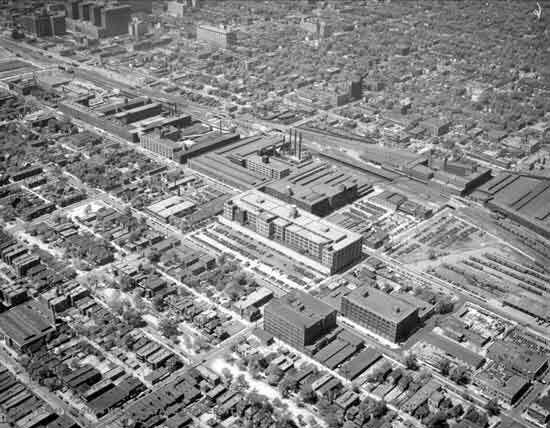 Scripps Motor and the Norton building (from way early in the thread) on Lincoln pre-1949. I all of my adventuring through the Sandborn Maps, I have never found any evidence of Reagal being at Woodward and Piquette. (MikeM knows what I am talking about). 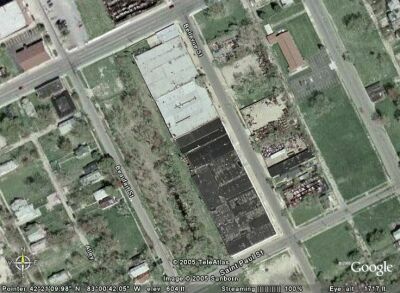 From some source now unknown, I also have a Scripps-Booth plant at Gratiot & Beaufait. Was this a mistake for the Columbia one? I've got a few photos to post soon of Regal, factory and cars, and a location of Harper & Hastings, maybe the Fisher # 23 parking lot (?). 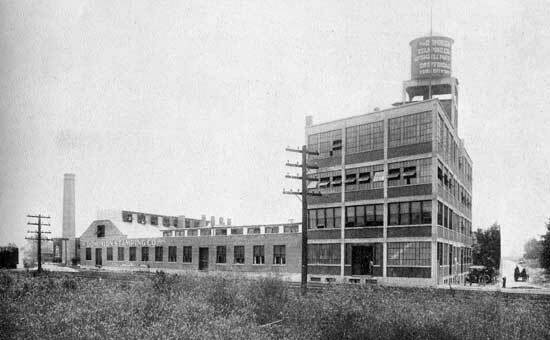 A photo of the Regal Motor Co (1907-20) factory that is labeled Harper and Hastings, from the DPL/NAHC. This is the photo that the postcard was probably made from. 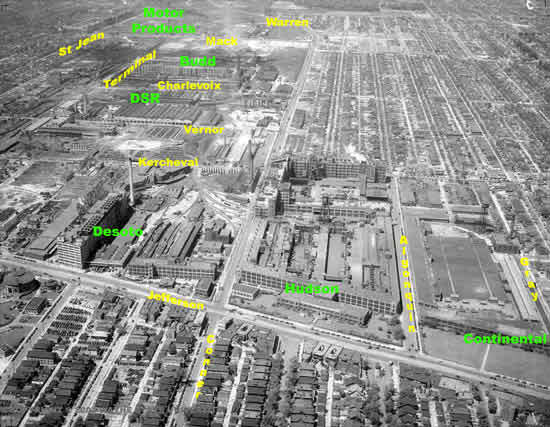 Here's an aerial shot from around the 30s showing the intersection of Harper and Hastings. Honus Wagner (in the backseat) of a Regal 30. Wagner was the Regal rep for Pittsburgh, and five of the Pirates owned them. 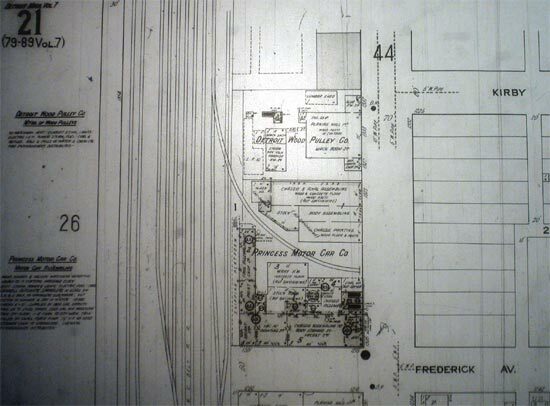 If anyone has a Sanborn map of that area, I would be interested in seeing what company was there. When I was there, the Goodyear sign was right inside of the building,the supports went thru the roof. PS. can we have a new page?? The whole photo, well worth seeing. If anyone wants the full size photo, do a search for Fisher at WSU/VMC. Hornwrecker, here's some more info. about Honus Wagner sent to jjaba from a life-long Pirates Fan, Rich Nase. After his retirement in 1917, Honus Wagner owned a Pittsburgh Regal dealership. In tribute, a 1911 Regal Underslung Raceabout is on view alongside one of his caps, an autographed ball, his Gold Lifetime Pass to Major League ballgames, and Frank E. Bingham's famous photograph print of "Honus Wagner", 1910. You can see these at the Carnegie Museum of Art in Pittsburgh. jjaba, research dept. with a little help from a friend. I took almost 200 Sandborn Map shots on Saturday and Wednesday. I figured I had pretty much everything covered but alas, I relize that I missed locations. 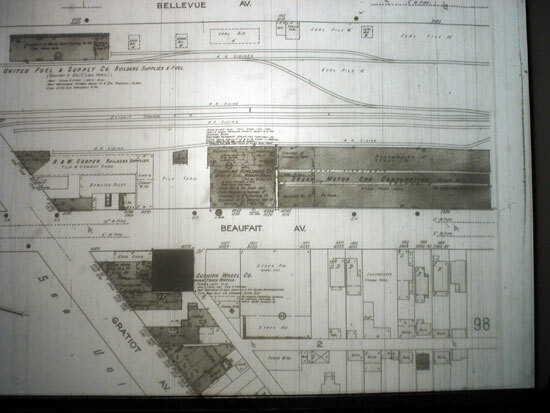 Factories that were non-automotive at the time of the maps but later became a car foctory or vice versa. Oh well. I'll start on Beaufait/Bellevue. Some of these shots are repeats but have been re-shot. 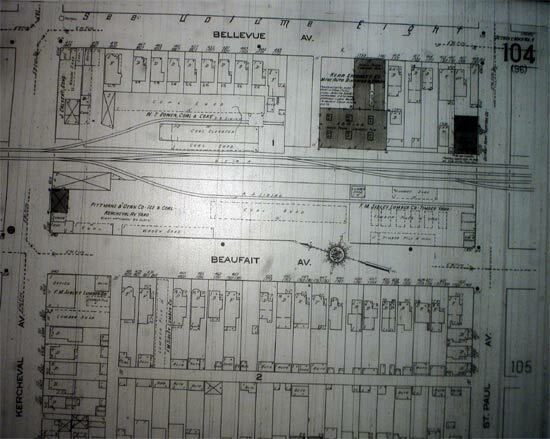 Saxon on Beaufait in 1922 and the same area today. The long white building seems to match. Aerocar/Hudson/Columbia. The two long buildings match. Notice the Malcomson Coal Company above the Columbia plant. Alexander Malcomson was a money partner of Henry Ford. Wasn't Henry's Mack Ave. plant across the street? The local Edison plant yesterday and today. Kerr Specialty Co. Mfrs of Auto Bindings. The map seems to match a rooftop in the lower portion of the groop of dark roofs. Finally, this square building is either 1111 Bellevue which has been identified as Standard Truck or via Google Maps, it could be 1305 Bellevue which was a Saxon/Demotcar/Princess factory but that may be wrong. I have more information to follow. Nothing on the Sandborn Maps match 1305. 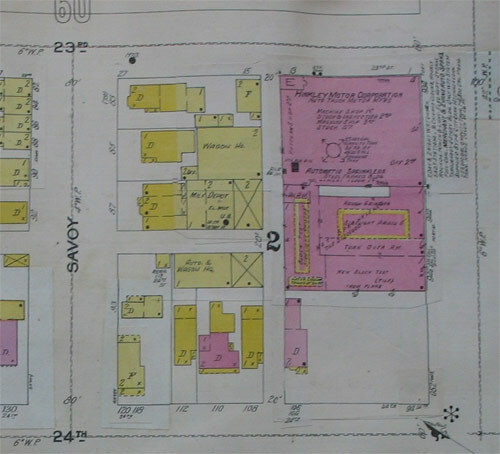 Sven An address for Princess that I got off of one of your color Sanborn maps previously is 1201-15 Frederick near Bellvue; in business from 1905-??. That's all I've got on Princess. 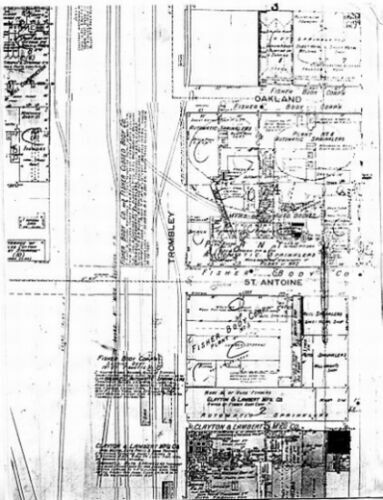 The Saxon plant at Waterloo and Beaufait was the Abbot-Detroit factory from 1910-18 from what I've got. Jjaba Thanks for finding some more Regal info, albeit more about Honus Wagner. It's funny that most of the info that we can find about Regal, even with them being in business for around 13 years, is of their most famous dealer. 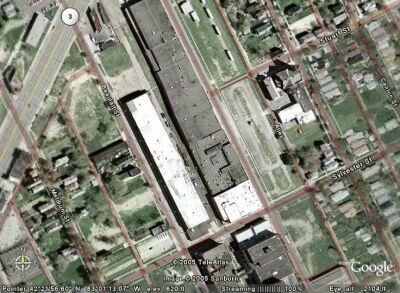 I don't think this view of the Electric Refrigeration Co./Kelvinator/Nash-Kelvinator/AMC/Chrysler/DCX factory on Plymouth has been posted yet. Probably from the 30s, and from the usual source. I hope this hasn't been posted yet. I'm adding another column to the spreadsheet for photo/map, so that one can see if there's been a photo or a Sanborn map posted for it. It might help keeping track of what's been done so far, if that is at all even possible. So far only a (p) for photo, and (s) for Sanborn, but can use different letters to denote other things if anybody has any suggestions. A short article on Princess. 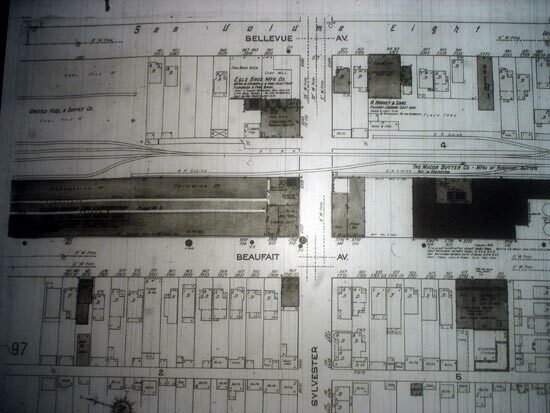 It mentions a first plant on Clay before moving to the Bellevue, former Saxon plant., went out of business in 1919. I found my 1305 Bellevue address from the Szudarek book but here's why I think it might be wrong. 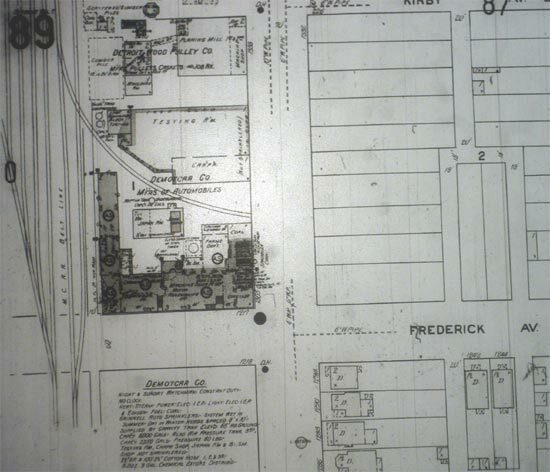 The Domotcar factory became Princess at the Frederick address according to the Sandborn Maps. While he did a wonderful job identifying and talking about so many of Detroit's auto companies, anything you read in Szudarak's book bears double checking. He should have had a couple of good automotive historians review his work in terms of accuracy. For as good a job as he did, there are more errors than one should expect. And, a complete index would have made it so much better. It lacks even an index arranged alphbetically by car company. The only index is one is car company names arranged by page number. To find a given car company, you have to go through the whole index. I received my copy from company that printed the book and from it's first run. If there have been additional printings, maybe some of these shortcomings have been corrected. 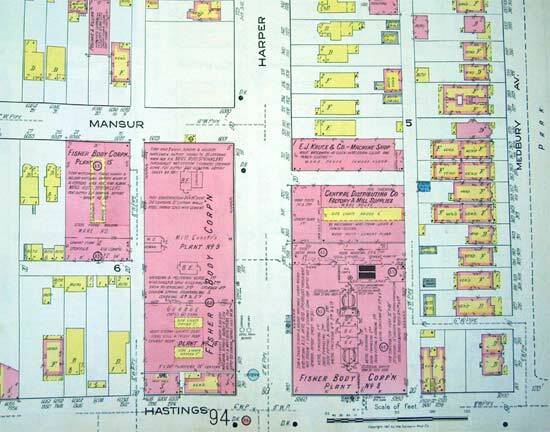 Hornwrecher asked for the Sandborn Maps of harper & Hastings and of the building by the Fisher plant on Hastings. See the Regal info above. I believe these are from 1915. Thanks Sven, I think the building I was in was the Central Distributing Company. Its hard to see but it looks like Factory and Mill Supplies. Perhaps now I can do a little digging. When I had my shop in that building, the southeast corner was already chopped off to make room for the SB I75 exit ramp to I94. I will never forget the 1" think steel I beams holding up the Goodyear sign. Hornwrecker does the Westside proud with the 1927 Nash-Kelvinator Plant. Wonderful photo. The admin. bldg. squares with Mark Twain Street along Plymouth Road. The admin. bldg. designed by Amedeo Leoni, the industrial layout by Wallace McKenzie, and the tower enclosure and industrial units by Willam E, Kapp, of Smith, Hinchman and Grylls. South of the factory along Mark Twain are workmen's housing in tudors and bungalows. They sold for $5,000 to $15,000, built by the land developers, Miller-Storm Company. These houses were built to accompany the factory. I'm glad Jjaba liked the Lord Kelvin plant, although I was a bit frightened being that far out on the Westside. I've updated the spreadsheet with the Demotcar/Princess info, but can't find anything else on Demotcar. Surprisingly the spreadsheet is turning up as one of the top links on google at Andrew's site. Any idea of how many downloads/views of the PDF there have been? It's getting pretty bad when you're searching for something, and all that shows up is our research. The more I look at all of those Fisher plants around Milwaukee Jct, the more confused I get. I've been playing around with PS for labeling pics, and for this I'm comfortably back on the Eastside for the Conner Corridor. I'm trying to see what colors, fonts, and sizes will work best against a B&W photo, at this resolution. The green against the darker elements. The yellow looks good against nothing. Good eye, Hamtramck Steve. You've got an eye for color. The idents. come up just fine. Thanks. jjaba knows Plymouth Rd., it isn't that far out on the Westside. Although in 1927, Kelvinator must have seemed like Yeminsville. In jjaba's youth, Livonia was way out. Oak Park and Southfield way out. And to schlep to Ann Arbor, fogettaboutit. jjaba, tells is like it tis. Formed 1909. Factory initially on 21st Street. 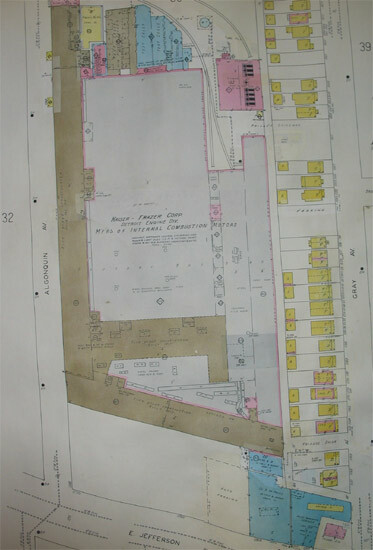 By December 1909, moved into 40,000 sq ft former Sun Stove Company factory at 1305 Bellevue. 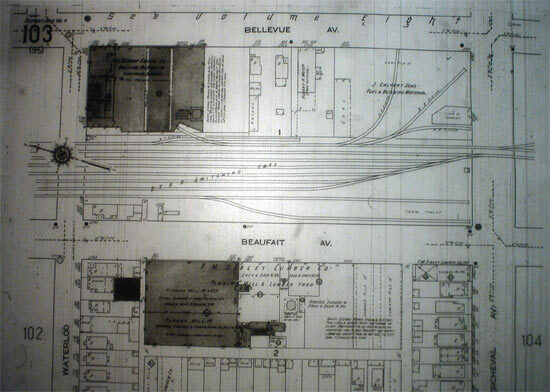 Translating that to the current address scheme places it on the west side of Bellevue, between Frederick and the Grand Boulevard, or at the south end of the Packard complex. The car was announced in September of 1909 with an estimated 3000 cars to be marketed. 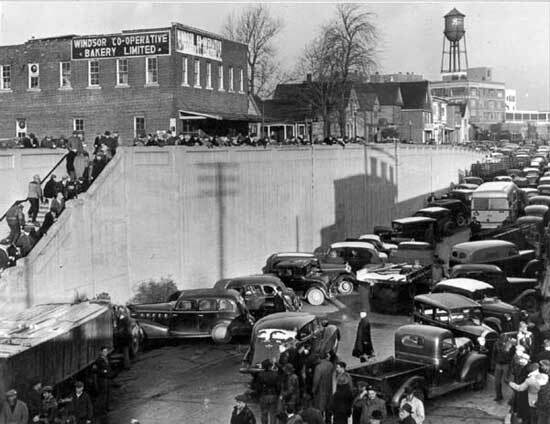 The Harper-Aldrich Auto Company at Woodward and Warren were the distributors for the state of Michigan. 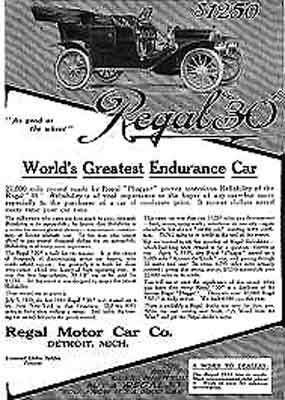 The Demotcar Company went bankrupt in August 1910, and production continued under receivership. 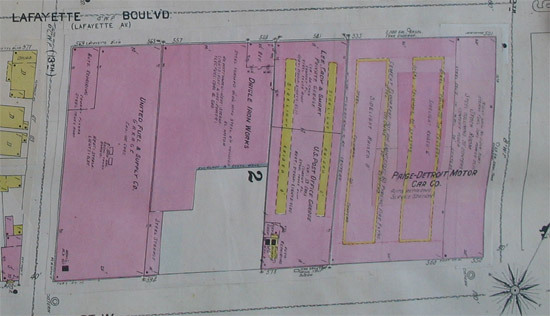 In December 1910, the company president acquired possession of the plant to resume operations. 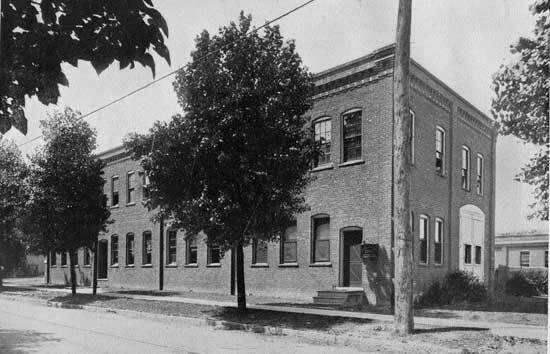 The company and officers moved to Madison, Wisconsin where they reorganized as the Ritter Automobile Company. 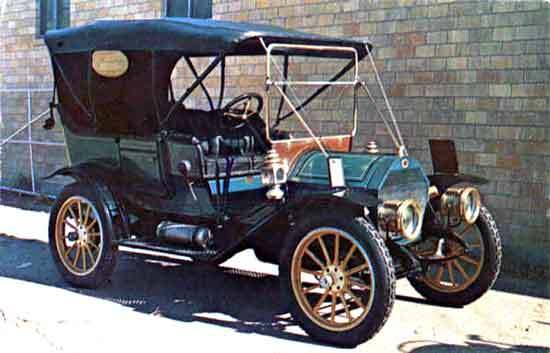 Ritter produced a larger car but production ended in 1912. Thanks for the Demotcar info, I should be getting the Szudarek book from the library this week, and will try to notate the spreadsheet a bit. 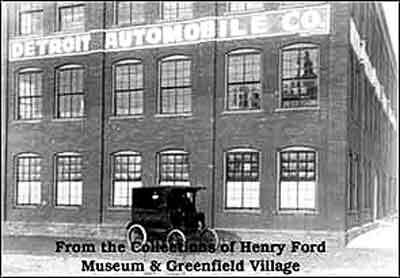 There was also another Detroit Motor Car Co. (company or corp.) that produced the Detroiter about 1912, with an address of 1915-17 Holbrook & Greeley to cause any confusion where none existed before. While searching for "Detroiter" I came upon this site about the Packard diesel Detroiter aircraft engine that you mentioned very early in this thread. Packard Diesel aircraft engine Not sure if you've seen this page before. Here are a few odd photos which don't fit anywhere else. 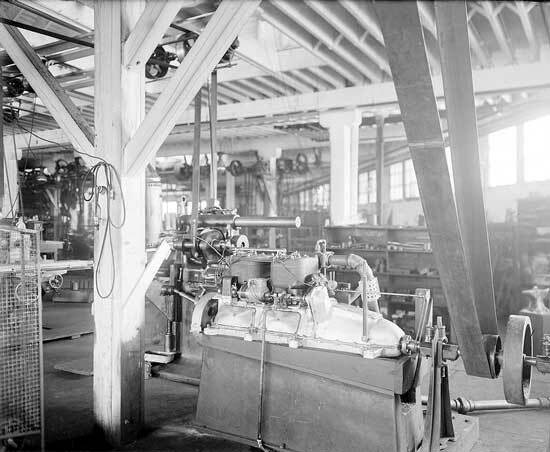 An interior shot of the Scripps-Booth factory, DPL/NAHC, appears to be a gas engine powering the belt drive system for the machine shop, or some type of primitive engine dyno. There are a few articles on this website about Barney Pollard a past, Detroit car collector who amassed around 600 cars, and about a musuem that never was. Just found some info on the Doble-Detroit steam car, 1914-17; the company mentioned in some brochures, besides the Doble name is the General Engineering Company of Detroit, Michigan. Maybe this name will show up somewhere. I found these at the Bancroft Library archive at Cal Berkley, and found this site searching for info on an Oliver steam car made in Detroit about the same time. Nothing other than a name and nebulous dates on Oliver so far. To complicate Hornwrecker's map, it looks like Continental was a Kaiser-Fraiser plant at some point. Does anyone know anything about the Weier Smith Truck Co.-Mfg. Auto Trucks that was located in Birmingham? The road to the north is Maple Road with Woodward just to the west. 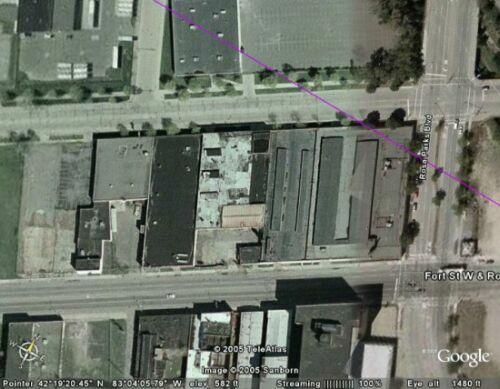 I figured out that the Demotcar/Princess factory in the Sanborn Maps above is 1305 Bellevue. I always try to show the cross streets and this time I didn't and didn't realize that vertical street was Bellevue. Thanks for the investigation on Weier-Smith Hornwrecker. These Paige buildings are still around. Is that East or West Lafayette? What is the nearest cross street(s)?